We’re almost there! The big day is tomorrow, and everyone at the Summer of Sonic staff is scrambling to set up our biggest show yet! We wanted to make sure you had all of the final details we wanted to share with you before the event starts. A final reminder, to please make sure you register and activate your tickets at http://hub.summerofsonic.com/ – without a valid ticket, you may be refused entry and we do not want that! Once registered on-site, you can print off your ticket or load up a mobile version so we can scan your barcode at the door. It’s incredibly easy to do and doesn’t take very long. Please make sure you do this! If you have any problems, please contact support@summerofsonic.com. We will be recording the entire day’s events – both on the main ‘Sonic’ Stage and on the smaller ‘& Knuckles’ Stage, so we can keep a snapshot of everything that happens on the day. But the main area surrounding the ‘Sonic’ Stage will also be streamed live – so if you cannot make it to Summer of Sonic in person, you can see all of the main activity from the comfort of your own home. A note for those who are attending Summer of Sonic: You will be entering an event that will feature live recording that will both be stored on tape and streamed in an unmoderated fashion over the internet. By attending Summer of Sonic, you consent to be included in any and all broadcasts produced by Summer of Sonic, both live and recorded. If you do not wish to be seen on our livestream or recordings, you should contact a member of Summer of Sonic staff once entering the venue. Further details can be found in our Terms and Conditions of entry included on your ticket. We have a lot going on during the day, so let us give you some advance warning so you can plan around all the activities we have. If you are holding a VIP Ticket, you will be allowed access to a backstage meet and greet session with a number of our special guests! This will take place from 12:45 – 13:15. We will collect VIP guests who wish to participate in this session from the Signing Desk at 12:40. Please do not be late! 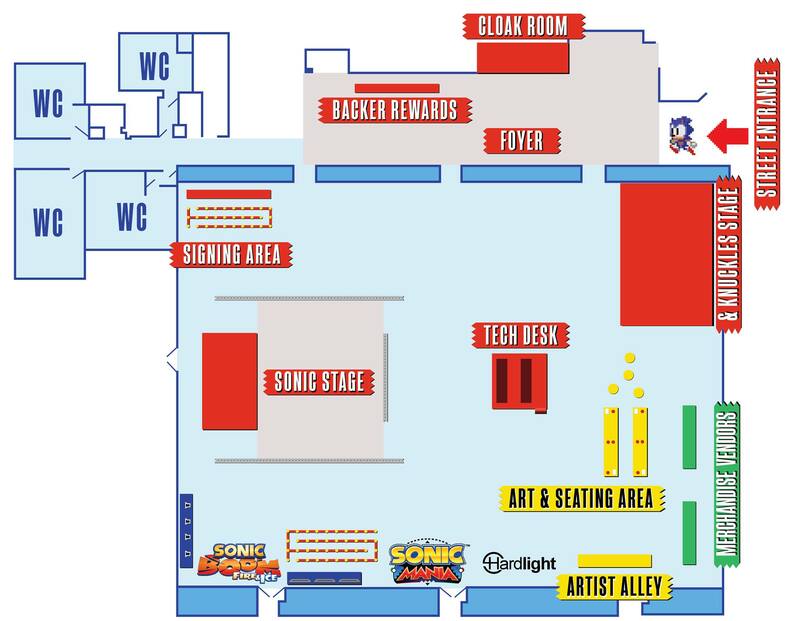 This floor plan will be included in your Summer of Sonic 2016 programme, but we thought it would be nice for you to see it before the day so you know where Sonic Mania is and you can rush to it where everything is and don’t get lost on the day itself. Upon entry to Summer of Sonic 2016, you will also receive a goodie bag which will include a programme for the day’s events and a couple of freebies. Use the bag to dump all of your purchased goods into so you don’t have to carry a mountain around with you on the day! We can’t wait to see you guys on the day! Take care, and we’ll see you soon! Thanks for making a livestream available this year! I really appreciate it, since at last minute I had to cancel my trip to UK. At least I can enjoy watching it from my home! Previous Previous post: Sonic Jump Fever Crowd Event and Sonic Dash Extreme at Summer of Sonic! Next Next post: Summer of Sonic SUCCESS!